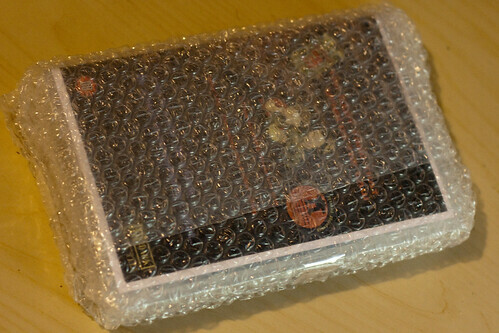 Yup, it’s unboxing time! 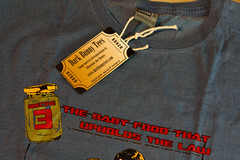 Today I received a t-shirt I’ve been looking forward to getting for quite some time – Robocop: Directive 3 Baby Food, from Dark Bunny Tees. I ordered this way back at the end of November last year, as a pre-order, with the expectation that it would be printed some time in January – February. Why did I pre-order? Because I have a bit of a thing for ED-209, because I really liked the idea behind the design, and because Alex Chenery seems like a really rather interesting chap. 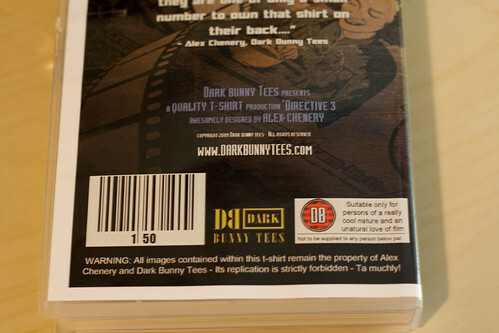 Anyway, enough of the pre-amble, lets see why I decided to do an unboxing of this t-shirt (all images link to larger versions on flickr)! 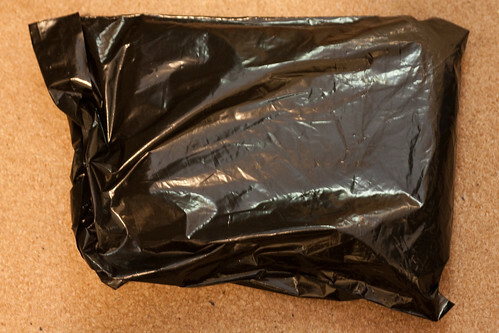 The t-shirt arrived in a nice simple, black posting bag, but it was immediately obvious to me that it didn’t just contain your average, limply inserted t-shirt. Oh no, it was obvious there was something more in here. Some sort of box. Of course, being an inquisitive chap I ripped the bubblewrap off the box and discovered a wonderful piece of custom artwork on an old-school VHS tape case. Frankly, this is a level of commitment I have never before seen in any t-shirt that I’ve bought. Of course, I’ve never bought anything that was in a limited edition of 50 worldwide before either, but that’s beside the point. Going to the trouble of creating a second piece of artwork to contain the t-shirt that I was actually purchasing is above and beyond the call of duty. 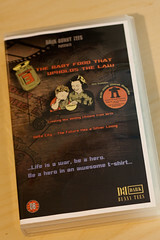 The box has a whole load of wonderful little touches, such as the rating certificate of “DB: Suitable only for persons of a really cool nature and an unatural (sic) love of film”, and the statement on the front that reads “…Life is a war, be a hero. 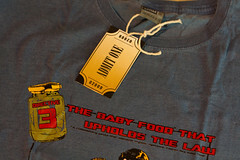 Be a hero in an awesome t-shirt…”. This packaging makes me happy. The t-shirt itself is also pretty damn fab. The weight is great, and the feel of the cloth is smooth to the touch. It’s a pity that the tiny text on the design is almost impossible to read, but that’s a very minor criticism. 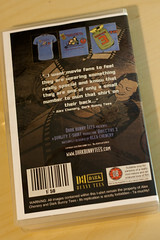 Other than that the design has transferred fantastically from Photoshop to t-shirt. So, congratulations Alex. 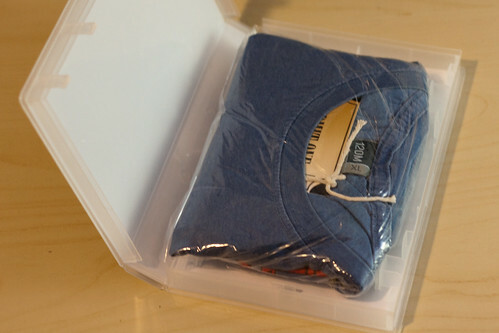 You’ve successfully made me happier opening this t-shirt than anyone has ever done before. Good job. 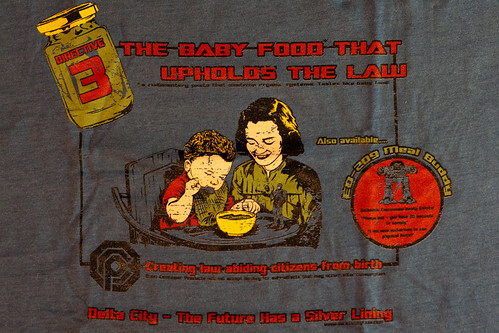 “Robocop: Directive 3 Baby Food” is part of a limited run of 50 t-shirts from Dark Bunny Tees, and is apparently still available for £25 from the website. You’d better get your skates on if you’re a fan though – I wouldn’t bet on it being around for long.